Don't wait to hear when you can feel. The R8 In-Ear Monitors Headphone is designed by music lover to stay true to the music sound and music soul. It brings out each relentlessly pure emotion within each note. Enjoy the mesmerizing audio experience each time you tune in the driving bass lines which reach to soaring or when mood-lifting. To do away with the need to re-adjusting earphones and provide a customized fit for all ears, this low profile R8 bass headphones is designed for long period listening sessions. It is also lightweight and come with five pairs of ear tips and a flexible memory wire. With its 3.5mm stereo jack, the sports earbuds has a great compatibility with a lot of music devices and all phone brands and Carriers: Windows, Android, Tablets, iOS and alike. BUILT TO LAST - Engineered for real-world reliability, the in ear monitors designed with 0.75mm UE pin, which makes the cable is detachable, you can change the headphone cable at any time manually for upgraded experience and convenience. Professional copper stranded wire that's engineered and tested with tangle-free lasting and durable quality. 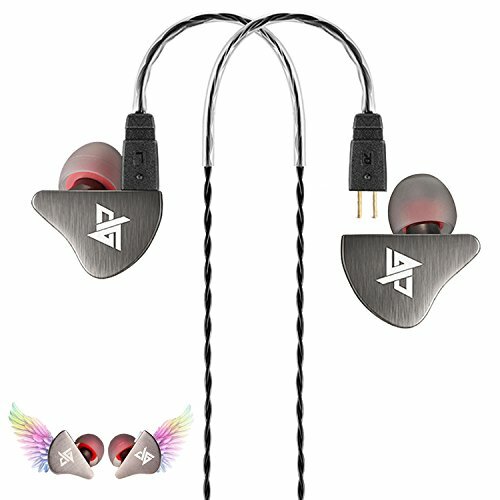 HIGH QUALITY SOUND - Adopts metal zinc alloy headphone cavity, this bass headphones built in F10mm dynamic driver can achieve premium and exquisite sound, wide sound stage, greatly restore the original sound quality, let you enjoy a well-balanced sparkling trebles, articulate mids and full bass. Perfect for running, jogging and other sports activities, stage monitoring, everyday use. UNIVERSAL FIT, CUSTOMIZED COMFORT - Utilizes ergonomic comfort-fit design, the sports earbuds come with removable ear hooks, flexible memory wire and four pairs of eartips to provide a secure, personalized fit for all ears, eliminating the need to re-adjust your earphones during workout while delivering clear and dynamic sound. SOUND ISOLATION DESIGN - The in-ear design of the monitor headphones blocks most external noise efficiently and enables lower-volume listening, protecting your hearing and improving sound quality. Comply memory foam eartips deliver maximum comfort and further increase noise isolation for a superior audio experience. WHAT YOU WILL GET - R8 in ear earphones includes protective carrying box, one set of Comply memory foam eartips, 3 pairs of silicone eartips, a couple of detachable ear hooks, shirt clip and Metal logo. These headphones are professionally designed so we provide one year quality warranty and 30-days free return to ensure your satisfaction. If you have any questions about this product by Aitalk, contact us by completing and submitting the form below. If you are looking for a specif part number, please include it with your message.